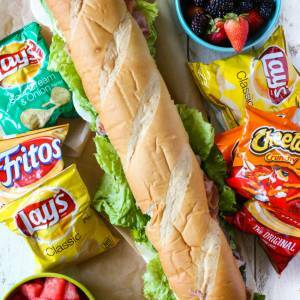 This party sub is an easy way to serve a crowd! The dressing used here is great for a sandwich like this–our taste testers whole-heartedly approved! This sandwich was one of their favorite recipes and they all agreed the dressing was what made it great! Slice the loaf of bread in half lengthwise. Using a spatula or a squeezy dressing bottle, spread the dressing on both sides of the bread. Place the cheese on the bottom half, then top with a layer of lettuce, tomatoes, and onions. Top with layers of deli meat, and, if desired, lightly sprinkle with oregano. Place the top of the loaf of bread on top of everything. Cover or wrap in foil, parchment, or plastic wrap and refrigerate until ready to serve. Before serving, slice the sandwich into 2-3” slices. Serve with chips and fresh fruit. Whisk to combine and store in a covered container or a dressing bottle. You will not use the entire recipe for 1 party sub, but it is great to have on hand for future sandwiches; you can store it for 1-2 weeks.